Dogs have ferocious appetites but even the strongest can fall prey to a sensitive stomach. According to the American Kennel Club, *the term “sensitive stomach” is usually used to describe mild intestinal upset in dogs. Its symptoms include vomiting, bloating, and loose stools. There are many possible causes linked to a sensitive stomach. It could be the result of your dog’s over-eating or secret rendezvous in the trash can. But if you’re confident that your dog is no scavenger, then examine other possible causes with your veterinarian so you won’t have to struggle to find the best food for sensitive stomachs. Dogs are like people too. While most dogs can gobble up a bowl of roasted chicken with ease, some dogs have trouble tolerating it. There are actually a wide variety of food ingredients that make dogs sick, not just poultry. Another possibility for his upset stomach could be the lack or excess of a certain nutrient. Real Meat – The dog food you choose should be made with real meat. The quality and protein source in the dog food’s formula is vital for your pet’s health. The best meat is muscle meat, not meat by-products that may include organs, feathers, hair, and even tumors lumped together during processing. Look for whole food sources and avoid those with non-specifically described meat such as ‘poultry,’ which could mean any bird apart from chicken. Also, take note that some dogs find it hard to digest other types of protein. If your dog is allergic to chicken, try switching to a different protein source such as beef, fish, etc. Reputable Brand – Choose among the top-of-the-line brands. Newer brands don’t mean they aren’t valid options, but well-established brands have already undergone several clinical studies over the years and have garnered a huge customer base. Hence, it would be easier for you to gather information through the experiences of countless customers. Wholesome Natural Ingredients - Walk away from dog food containing cheap filler ingredients. Soy, in particular, is estrogenic and can damage your dog’s endocrine system. Likewise, avoid dog foods containing preservatives, flavor enhancers, and colorants. Complete and Balanced – Your dog could be suffering from nutrient deficiency and hence opt for a dog food that contains the necessary nutrients for strength, immunity, and proper digestion. The protein, fiber, carbohydrate, and fat content should be appropriate to his life stage. Most dogs display their stomach problems through diarrhea, which can be life-threatening. Know that diarrhea can lead to dehydration. Feeding Doggo a specially formulated dog food for his sensitive stomach can prevent this. Food that is not well-suited for his needs also requires a correspondingly higher percentage of poop-picking. It’s fine to spoil him from time to time, but always remain vigilant. 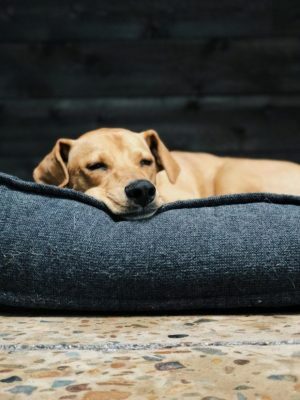 A healthy digestive system optimizes your dog’s mental and physical well-being as it enables better absorption of nutrients that your dog needs for energy, growth, cell repair, etc. Proper digestion breaks down food into nutrients that are transported by the blood to the cells throughout your dog’s body. When your dog is free from digestive problems, he will no longer have to endure pain and discomfort. A delicious bowl of dog food that will also benefit his sensitive stomach will be enthusiastically received. A dog’s health can be mirrored by the quality of his skin and coat. When your dog is healthy inside, good looks follow suit. Hill’s Science Diet Sensitive Stomach & Skin is made in different varieties to suit dogs of different sizes and breeds. It is specially formulated to provide your dog a complete and nutritionally balanced diet using real ingredients. Each ingredient is carefully selected for its nutritional properties. Its main ingredients are chicken meal and barley. Compared to raw chicken, chicken meal is more condensed and contains up to 300% more protein. Barley, on the other hand, is 90% carbohydrates and an excellent source of fiber and manganese. It is also considered for its anti-diabetic properties. In addition, Hill’s Science Diet Sensitive Stomach & Skin contains gluten-free whole grain sorghum and flaxseed, both of which are rich Omega-3 and Omega-6 fatty acid content. Know that Omega fatty acids make your dog’s coat healthy and shiny while promoting cardiovascular function and cognitive development. Dried beet pulp is also added to help promote gut integrity, as well as a mix of fruits and vegetables for an assortment of vitamins and minerals. Likewise, Brewer’s rice is added to provide texture and more fiber. Hill’s Science Diet Sensitive Stomach & Skin is inarguably delicious for dogs, but barley and Brewer’s rice tend to make it very filling, so it is unlikely that they will overindulge in it. Hence, this dog food is well suited not only for those with GI issues but also for porky pooches who need to lose weight. Toxic truffles or delicious treats? You may feel guilty looking into his big sad eyes, but you may be just saving your dog’s life by saying ‘no.’ It is important that you consider healthier options even for your dog’s snacks. Surely, you’ll be happy to know that your pooch can have a delicious and nutritious nosh with the NUTRO Natural Choice Health Benefit. NUTRO Natural Choice Health Benefit is 100% organic and hence no bewildering list of additives, artificial flavors or colors that could trigger canine sensitivities. In fact, this treat is specially made for allergic and GI-sensitive dogs. NUTRO Natural Choice Health Benefit focuses on high-quality protein and uses real chicken meat as its protein source. This crunchy biscuit is also blended with fiber-rich pumpkin, brown rice, wheat, and chicory. Coconut is also added to help strengthen your dog’s gut integrity with each bite, as well as flaxseed for its Omega fatty acids to give your dog healthy skin and a lustrous coat. Rule of thumb: an abundant supply of fresh water should come hand in hand with dry treats as this will augment the assimilation of the food and absorption of its nutrients. Salmon for dogs? YES! Contrary to popular belief, salmon is one of the best human foods for our canine companions. Not only does it satisfy their palate, it provides ample of health benefits as well. For one, salmon is rich in Omega fatty acids that promote the immune system and reduce inflammation. Know that inflammation is linked to a number of diseases including arthritic conditions. The right balance of Omega-3 and Omega-6 fatty acids promotes cognitive development and heart health. Likewise, it leaves your dog’s skin itch-free and his coat shiny. Salmon is also a good source of protein that satisfies sensitive stomachs without causing discomfort. In addition, rice and oatmeal are added as secondary ingredients, both of which add valuable nutriment in the form of fiber to promote easy digestion. It is important to note that this dog food does not contain any by-product meal since some dog owners prefer to avoid such. This product also does not contain corn, wheat, or soy that could trigger allergic reactions in some dogs. Crunchy, healthy, and nutritious, your furry giant will surely love the Purine Pro Plan FOCUS Sensitive Skin & Stomach! You wouldn’t want to give your child food that has a list of ingredients you don’t understand, and hence Wellness Simple Limited-Ingredient Diet is an excellent choice for fur-parents who prefer dog food made with familiar wholesome ingredients. This dog food contains few, simple ingredients that provide the satisfaction and nourishment that Doggo needs. Its primary ingredient is salmon, a rich source of protein and Omega fatty acids. Dogs require daily high-protein consumption to keep their muscles lean and strong. Omega fatty acids, on the other hand, reduce inflammation and add mobility to your dog’s joints. It also leaves your dog’s skin and coat healthy. Combined with potatoes, this limited-ingredient dog food ensures your dog receives the right amount of carbohydrates so he has the energy for playtime and adventures. Tomato pomace and flaxseed oil are also added for their nutritional benefits. This product is also fortified with vitamins and minerals to strengthen your dog’s digestive and immune system. Wellness Simple Limited-Ingredient Diet does not contain animal by-products, eggs, and gluten that may upset sensitive stomachs or trigger allergies. Likewise, it does not contain artificial colors or flavors. Blue Buffalo Basics Limited-Ingredient has covered the essential nutrients to keep your dog in good shape. Made with simple wholesome ingredients, Blue Buffalo Basics Limited-Ingredient is well-suited for dogs prone to GI issues and allergies. You can rest assured that your dog won’t be exposed to certain ingredients that may be harmful to his system. Its formula is free of preservatives, additives, artificial colors, grain, and meat by-products. It features a vivid flavor due to the fact that it’s made of fresh, whole ingredients. 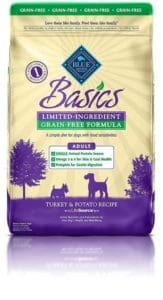 Blue Buffalo Basics Limited-Ingredient uses real turkey as a single-source protein and primary ingredient combined with a scrumptious mix of potatoes, pumpkin, and pea fiber. Potato is a highly digestible source of carbohydrates, which makes it a great alternative for grain. Likewise, this dog food is fortified with glucosamine to promote mobility and calcium for strong bones and teeth. Despite its limited ingredients, every bowl of Blue Buffalo Basics Limited-Ingredient ensures your dog receives a nutritious and balanced meal. It is very frustrating to see your dog happily gobbling up his favorite food, only to find him vomiting a few minutes later and feeling sick all throughout the day. We understand that finding the top dog food for sensitive stomachs demands much time and effort, and you wouldn’t want to risk your dog’s health by shifting from one diet to another each time it fails. Doing such may only aggravate your dog’s sensitive stomach. Doggo may continue to insist on what he thinks is delicious, but you need to put down what is beneficial to him. Thankfully, there are dog foods for sensitive stomachs that are flavorful enough for our furry housemates with discerning taste buds! So we gathered all the information we can get to determine what is good and what is best and hence we came up with a list of five. If your dog is not allergic to grain, we highly recommend Hill’s Science Diet Sensitive Stomach & Skin. This brand outperforms its competitors when it comes to its protein content and its collection of essential nutrients.